One set Cuttings Dryer GNCD930C, fixed speed (800rpm), with air line, upgrade scraper and basket screen. Working together with diaphragm pump. Screw conveyor is composed of electric motor, gear box, screw or auger, bracket, coupler, feeding hopper, solids discharge port, cover, etc. They are often used horizontally or at a slight incline as an efficient way to move the drilling cuttings from solids control system. A peristaltic pump is a type of positive displacement pump used for pumping the drilling waste to the top hopper of the vertical cuttings dryer from the cuttings collection hopper. The 3ways of feeding system may be adopted to different conditions according to the jobsite situation. When there is enough place and enough financial support, you can choose vacuum unit together with 2 units of screw conveyor, one is installed horizontally and the other one is installed inclined. But for compact design, hose shear pump might be an ideal choice. GN solids control will design the drilling cuttings disposal sytsem customized, we need to have the engineer team to visit the client’ jobsite firstly then give them a proper solution. 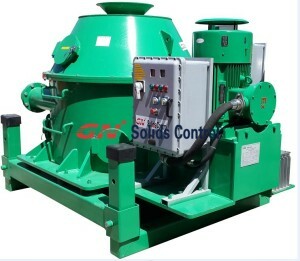 Pls contact GN solids control to get more solutions. If you wish to contact sales in USA, pls contact GN solids America. GN Solids Control upgraded 2nd generation model vertical cuttings dryer have two model: GNCD930C and GNCD930C-VFD. GNCD930C could be the base model, fixed speed Vertical dryer and GNCD930C-VFD is added 1 VFD control panel primarily based on the base model, to become variable speed. But as the speed of Vortex is 900rpm, not as well high, there is no major difference among GNCD930C and GNCD930C-VFD. GNCD930C is the most common model for Nigeria customer. The majority of customer buys this model to have base requirement and save income. Vertical-G dryer can’t function separately, it have to have to operating with each other with Decanter centrifuge to get improved treating result. GN drilling Cuttings management system is standard instance on the best way to use GN vertical-G dryer and higher speed decanter centrifuge. 1) It added a air knife to clean the basket screen in the course of functioning to prevent hole blocking. two) The oil lubrication cooling program tends to make the oil lubrication much more steady and appropriate temperature for bearing perform. These two components make GN vertical cuttings dryer or GN vertical-G dryer or GN Vortex get a lot much better working efficiency in the course of real job. GN Decanter Centrifuge with 3200rpm higher speed centrifuge GNLW363 series centrifuge is the most common centrifuge model for Nigeria consumer. Several consumers get this centrifuge for solids manage & waste management service. USA drilling waste management using the techniques and technologies that allow them to meet their requirements at every single stage with the drilling method as a result of ensuring efficient and profitable production. We provide drilling fluid techniques engineered to improve drilling overall performance by anticipating fluids-related problems, fluid techniques and specialty resources built to optimize wellbore productivity, production engineering answers to maximize production costs, and environmental options that securely handle waste volumes produced in both drilling and manufacturing operations. So as to sustain and boost world oil and fuel manufacturing, increased levels of drilling will be vital in increasingly challenging and complex environments, leading to wells with longer and much more complex profiles. Understanding the technical challenges and mitigating the consequent chance beforehand of the drilling and production packages can mean key cost cost savings and nicely overall performance improvement for our clients. drilling waste management plays a critical element in meeting these challenges. In May 2012, Gnsolidsamerica grew to become a part of Schlumberger by way of its merger with Smith Worldwide. The main driver behind this merger is drilling optimization: in order to sustain and improve globe oil and gasoline manufacturing, higher ranges of drilling will likely be needed in more and more challenging and complex environments. This means wells with longer and even more complex profiles. Knowing the technical challenges and mitigating the consequent threat in advance of the drilling system can imply key value cost savings and very well functionality improvement for our clients. Gnsolidsamerica will perform a important portion in meeting these difficulties. From its earliest roots, Gnsolidsamerica acknowledged that it ideal served its customers, not by delivering drilling fluid items for the consumer?but by anticipating and planning for how those merchandise would behave in the downhole natural environment, both to optimize drilling effectiveness and also to lessen the threat associated with fluids-related challenges. No matter if delivering drilling fluid programs and merchandise, completions methods, solids handle capabilities, stress control, waste management, production technologies or horizontal and directional drilling for mining or water wells, Gnsolidsamerica is there to supply the solutions, companies and experience you will need for your task. Whether providing drilling fluid systems and products, completions systems, solids control capabilities, pressure control, waste management, production technologies or horizontal and directional drilling for mining or water wells, gn is there to provide the products, services and expertise you need for your project. Different companies produced solid control system will certainly be differences, so we strongly recommend that you choose GN machine, its workmanship is very fine place, enough to make your eyes light up.